Cavity Nesting Birds can be difficult to find. For example, I found this bird by accident because it was far away and hidden behind branches. 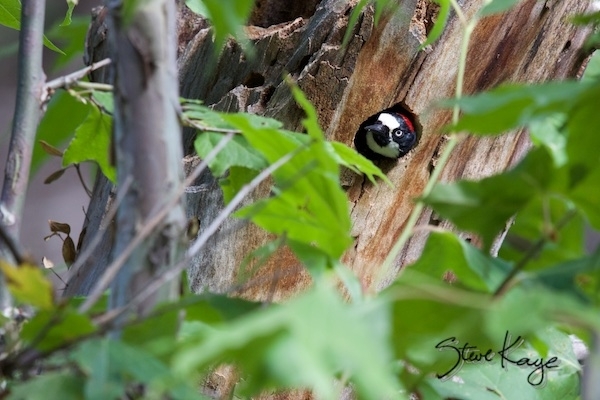 It’s an Acorn Woodpeckers, female, looking out of a nest cavity. Many birds depend upon old trees as nest sites. So this woodpecker is here to remind us to preserve old trees. The Cavity Conservation Initiative in Southern California is working with arborists, tree trimming contractors, park officials, and others to protect cavity nesting birds. Learn more about them through the link below. Hey Ma, Look at Me! No Wings! Thanks for bringing attention to this very important issue!